Published: Nov. 13, 2016 at 10:56 p.m. Updated: Nov. 14, 2016 at 07:19 p.m. Opportunity is the name of the game in fantasy football. Talent matters, of course, but we want players who see a healthy volume of targets and touches to anchor our lineups, especially in daily fantasy. Every week in the second season of the Opportunity Report, we'll look at all the passing targets for every NFL team and the percentage each player owns. Franchise will handle the backfield touches section this year and his Week 10 piece is tabbed above. There is little clarity in the Cardinals receiver corps. Michael Floyd had his first big game of the season after losing playing time steadily as the year has gone on. John Brown (38 percent of snaps) and J.J. Nelson (59 percent) split duties as the No. 3 behind Floyd and Larry Fitzgerald. Nelson did little with his newfound opportunity in a prime spot. Julio Jones leads all pass catchers in Week 10 in handling 51.6 percent of his team targets. It was far and away his largest share of the pie this season. Taylor Gabriel's average depth of target (36.5) was the highest of any wide receiver on the day. He's a streaky deep threat and only played 33 snaps on Sunday. However, his deep speed has made a huge difference for the Falcons, as he has catches of 76, 26 and 47 yards the last three weeks. Austin Hooper garnered just two targets despite playing on 73 percent of the team's snaps. He had a chance to seize the starting role by doubling down on his strong Week 9 performance, but this likely leaves the door open for Jacob Tamme to re-take the job when he's healthy. It just does not seem to be happening for Dennis Pitta, despite the volume being in place. Pitta played 86 percent of the snaps and saw six targets, but those came at an average of just 1.7 yards down the field. The veteran tight end has yet to find the end zone this season, and hasn't scored a touchdown since 2013. At some point he'll reverse course on that, but it's getting harder to chase. Steve Smith was obviously the alpha, as usual, but it was good to see Breshad Perriman start to get into the action. He played only 48 percent of the snaps, behind Mike Wallace and Kamar Aiken, but his arrow was starting to point so far downward he needed this long bomb to capture some momentum. Kenneth Dixon played on only 32 percent of the snaps, behind 48 percent for Terrance West, but had a clear, defined role in the passing game. We should expect him to hold that position going forward. Kelvin Benjamin extended his streak of having either 70 yards and or a touchdown, a feat he's accomplished in all but one game this season. His consistency has been a welcome addition considering he was a volatile producer as a rookie. It was Ted Ginn that beat the aggressive Marcus Peters deep, but he played on less than 40 percent of the Panthers snaps in this game. It's impossible to expect a week-to-week consistent output with that minuscule amount of playing time. The volume was there for week-to-week producers like Zach Miller and especially Alshon Jeffery. However, with Jay Cutler completing just 53.3 percent of his passes for 6.1 yards per attempt the quarterback play was too ineffective for it to matter. Cameron Meredith played 96 percent of the snaps, but only saw two targets. It's hard to recommend chasing his fantasy output, as this was the third game in a row where he only caught one pass. This time it just happened to be 50-yard Hail Mary to end the first half. Even with Corey Coleman back in his second game, it was Terrelle Pryor that held the dominant percentage of the team's targets. Coleman did play more snaps than Pryor, but overall the rookie has not gotten cooking since his return. The timidity of Cody Kessler followed by the instability created by pulling him for Josh McCown later didn't help the passing game either. Since returning from injury Dez Bryant has target totals of 14, four and nine. In that span, he has two 110-plus yard, one-touchdown games, with a one-catch for 19-yard clunker sandwiched between. Dak Prescott has shown a propensity to not force the ball to one player, and rather take the best matchup that the defense presents. 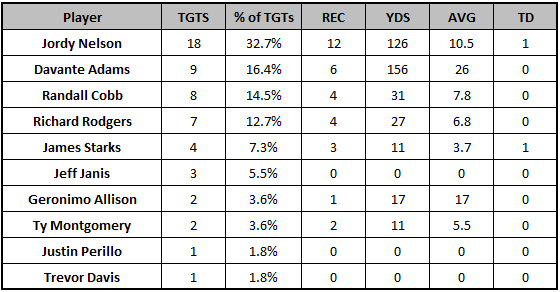 Occasionally, that's going to take the ball away from Dez Bryant, but it's good for Dallas' overall production. Nothing new to report for the Broncos up and down the depth chart, but the order at the tip-top does appear to be switching. Earlier in the season, it was Emmanuel Sanders that looked like the No. 1 target, but Thomas appears to have reversed that course in recent weeks. Thomas saw 11 targets after seeing 10 for four straight weeks heading into this game. Sanders' targets have been roughly similar, with six, eight, 10, 11 and then nine today. The truth is just that these two are nearly identical in overall usage, but it's been Thomas who is scoring the touchdowns of late. Randall Cobb still isn't playing a full complement of snaps in his comeback attempt from an injury. He was out on a just 68 percent of the Packers' plays on Sunday. Jordy Nelson and Davante Adams each played 93 and 95 percent of the snaps. Adams continues his rebound season, and got open down the field on post routes with regularity. His 18.5 average air yards per target led the team, by far, and he owned a 31.7 percent share of Rodgers' intended air yards. The "Ty Montgomery playing the part of Theo Riddick" storyline appears to be over. Montgomery still played 90 percent of his snaps in the backfield, but was only out on 22 plays overall and saw just two targets. We are certainly at "it is what it is" territory with the Texans. The volume is even there for DeAndre Hopkins, who saw a whopping 48.1 percent of the team targets. It all comes down to the issues behind center for Houston, as Brock Osweiler threw for 99 measly yards on Sunday. This team has a real problem at quarterback and even their fans know the winning can't mask it. This was a disappointing line from C.J. Fiedorowicz, who came into this game with a ton of momentum prior to the Texans bye week. However, you shouldn't panic on him just yet. Despite losing two touchdowns to his backup tight ends, Fiedorowicz played on 89 percent of the team snaps. Variance just happened to bite him when the Texans got into the red zone. Allen Robinson reminded us in Week 10 why it's so hard to give up on a player who isn't producing even though the volume is there. He now has target totals of 15, 12 and 13 since his disastrous Week 7 line against the Raiders. In those games, he's amassed 253 yards and two scores while playing better each week. Julius Thomas snagged a red-zone touchdown, but he's losing both playing time and downfield targets. Thomas played on just 54 percent of the team's snaps on Sunday. Tyreek Hill: five and 13 targets. 58 and 61 percent of the snaps. Chris Conley: four and three targets. 88 and 84 percent of the snaps. Albert Wilson: eight and seven targets. 70 and 73 percent of the snaps. The writing is on the wall that Conley just doesn't seem to fit with the overall short-game philosophy of the Chiefs passing attack. Both Wilson and Hill have been the most involved players despite Conley far out-snapping both of them. Of course, the pendulum could easily swing back Conley's way next week considering he's on the field so much. All three of these players will be in consideration if Jeremy Maclin sits out another week, as the Chiefs get the Buccaneers in Arrowhead Stadium. After playing over 70 percent of the snaps in the games off the bye, Brian Quick fell back to 63 percent and behind Tavon Austin again at 67 percent. Chasing Quick's ceiling will be inadvisable in this passing offense if he's inching closer to half the snaps instead of a quarter of them. Lance Kendricks was a popular streamer this week at the tight end position, but that didn't work out. Kendricks still saw a tremendous amount of playing time, going out for 82 percent of the team snaps, but collected just two targets on the day. Hey, these things happen when you get into bed with mediocre talents in bad offenses. When you start to run the ball with authority, the play-action game opens up a ton of opportunities for the downfield passing game. Both DeVante Parker's first catch of the game and Kenny Stills' long touchdown reception came off play action. With the run game working effectively, expect the Dolphins to be a bit more liberal with their deep shot. Parker also played 80 percent of the team snaps, ahead of Stills' 70 percent. It's going to be a chore projecting any consistency for these Miami receivers with the run game clearly being the newfound focus of the team, but there is more potential for big weeks now than there was several weeks ago. We can expect No. 1 receiver type of usage and production from Stefon Diggs every week. Diggs has target shares of 27, 35, 35, 35 and 38 percent in games where he hasn't been on the injury report with a groin injury (which he played through early in the year). He's been dominant in those games, racking up 605 yards and a pair of touchdowns. He's the only true top-level threat they have on offense right now, so there's no reason to expect this to change. Once again, the Vikings used Diggs frequently in the slot so that they could get him the ball with ease in light of the offensive line issues. He accumulated 93 percent of his yards from the slot on Sunday. Martellus Bennett is healthy, so it seems. He played 66 percent of the team snaps and was second on the team in targets. Bennett should remain a major factor going forward as long as he's at 100 percent. None of Chris Hogan (47 percent), Danny Amendola (39 percent) and Malcolm Mitchell (31 percent) are playing enough snaps to be week-to-week consequential producers. James White played 42 percent of the snaps but saw the lowest amount of targets he's seen with Tom Brady under center yet this season. Dion Lewis is now off the PUP but was not made active for this game. In what was his toughest test of the season, Michael Thomas posted his lowest statistical output since Week 2. However, Thomas still led the Saints wide receivers playing on 86 percent of the team's snaps. There's no reason to panic; plenty of wide receivers with even higher pedigrees fail to come through against Denver. In somewhat of a surprise New Orleans used a ton of two-tight end sets, deploying the grouping on 20 of their plays, which was more than any other package. As a result, Coby Fleener (63 percent) played more snaps than Willie Snead (59 percent) and Josh Hill (51 percent). That's off the usual trend for the Saints, but of course, we know that the Saints have long been malleable with their personnel usage. There was plenty of talk about an advancing in Bryce Treggs playing time, but the speedy former Cal wideout only played 15 total snaps. Dorial Green-Beckham played about half the snaps, but went without a catch for the second straight week. This cast of characters is irrelevant beyond Jordan Matthews and Zach Ertz, and even the latter is pushing it. Antonio Brown and Le'Veon Bell handled 60.8 percent of the team's targets and are the clear dominant forces in this passing attack. However, the development at in the search for a complementary receiver took an interesting turn. Cobi Hamilton (91 percent) and Eli Rogers (86 percent) operated as the No. 2 and No. 3 season, with Rogers being the main force out of the slot. It appears that the team and specifically Todd Haley have run out of patience with Sammie Coates, who played just two snaps against the Cowboys. His drops, mistakes, and injuries have severely cost him, despite his explosive potential. The Chargers continue to find creative ways to get Tyrell Williams in position for big plays. While he played only nine snaps in the slot, he hauled in two 15-plus yard plays from the inside including his 51-yard catch and run for a score. Williams also played the most snaps (94 percent) among the wide receivers for the first time all year. He's clearly the No. 1 receiver for this team, especially with Travis Benjamin suffering a PCL injury that kept him out of Week 10. Hunter Henry and Antonio Gates both caught touchdowns in the red zone on their lone targets inside the 20-yard line. However, the snap share was not even close with Gates playing on 73 percent and Henry on just 35 percent. The Chargers took it slow with Gates' playing time in his first few weeks back from injury, so perhaps they are taking the same approach with Henry, who missed Week 9 with a knee injury. This was the second week in a row where Quinton Patton led the team in targets. While it didn't amount to the same production that came in the Saints game, Patton is establishing some momentum. Colin Kaepernick is starting to at least play acceptable football behind center the last two weeks. There might be life in this receiver corps yet. Tyler Lockett and C.J. Prosise made waves in Week 10. Lockett finally looked like the sterling deep threat that he was last year. His 16.3 average depth of target led the Seahawks receivers by a full-three yards. Lockett looked uncoverable on a few of his deep shots, but still only played 58 percent of the team snaps, and trailed Jermaine Kearse in targets. Rookie back C.J. Prosise led the team in running backs snaps and showed dynamic ability as a receiver. He caught all seven of his targets for 87 yards, 73 percent of which came on non-backfield lineups. Prosise snagged two catches for 45 yards out of the slot and another 18-yard reception lined up out wide. He's a dangerous threat in the open field, compiling 53 receiving yards after the catch, and with the Seahawks pass attempts per play up once again this year he will remain a fixture. Fantasy owners ask "what's going on with (Player X)" and "why isn't (Player X) doing (something that would help their lineup" as if there is always some sort of meaning behind it. Sometimes, in football, stuff just happens. That's likely the best explanation for why Mike Evans didn't see a target in the first half. Just one of those things. Let's also not forget that interception returns, especially those returned for touchdowns, limit the opportunities of the offense whose defense registers the takeaways. The Bucs had two such instances off Jay Cutler in the first half on Sunday. As such, Mike Evans was only on the field for 58 total plays today. Again, these things happen. The Titans were consistently leading the Packers on Sunday, which is strange to say, so the passing game didn't need to take to the air with much volume. Rishard Matthews came down with his sixth touchdown in as many weeks, and also led the wide receivers in snap share with 82 percent. Kendall Wright also scored, but was once again a sub 50 percent playing time receiver. With the whole passing attack due for some statistical regression in the touchdown department, you only really want to chase Matthews' line due to his playing time. With DeSean Jackson out for this game, Ryan Grant stepped in to play 79 percent of the snaps. He did not appear to be much of a threat for targets, though, as he saw just three to Jamison Crowder's six. At this point, it might be past time to take Vernon Davis' role in this offense seriously. Davis saw 53 percent of the snaps to Jordan Reed's 79 percent. He also siphoned three targets away from Jordan Reed, who saw just four on the day. It may be tough for Reed to hit the weekly ceiling he had last year with Davis in tow. You can rely on NFL.comâs Touches and Targets column for great fantasy advice. Just like you can rely on FedEx Ground for fast and affordable shipping.